Put the flour on the work surface and make a well in the centre. Put in all the other ingredients and begin by mixing gently with your fingertips, gradually drawing in the flour. When all the ingredients are mixed, work the dough harder with the heel of your hand. Roll the dough into a ball, wrap in a cloth and leave to rest in the fridge for 1 hour before using. The night before, put the prunes in a saucepan, cover with water and add the tea bags. Boil for 5 minutes, then take the pan off the heat, cover and leave overnight. The next day, drain the prunes and stone them. Prepare the pastry cream: bring the milk to the boil. Beat the sugar with the egg yolk until pale, then mix in the fl our. The mixture should be like very fine breadcrumbs. Gradually pour on the boiling milk, stirring continuously. Pour the mixture into a saucepan, heat it until it bubbles, then cook gently for 5 minutes, stirring all the time. Pour into a bowl, cover and leave to cool completely. Line a 25cm/10in fl an dish with the pastry and prick the bottom with a fork. 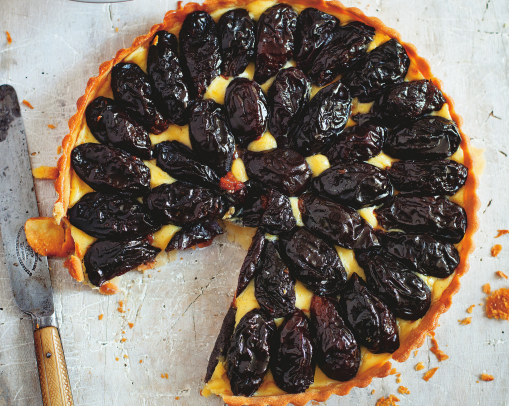 Put in the cold pastry cream and arrange the prunes on top; the pastry case should be threequarters full. Bake in the preheated oven for 30 minutes. Leave the cooked tart to cool completely and serve with whipped cream on the side. Do you enjoy trying new recipes? Subscribe to FrenchEntrée magazine, your best source of French lifestyle inspiration.